We produced this report card to provide a regional overview of the status and trend of the natural resource base of the pastoral rangelands in Western Australia. This report card will be of specific value to pastoral lessees, other rangeland and pastoral managers, and industry and government decision-makers with an interest in pastoral areas. It was published in 2017.
provide managers with enough information to improve pastoral rangeland management. 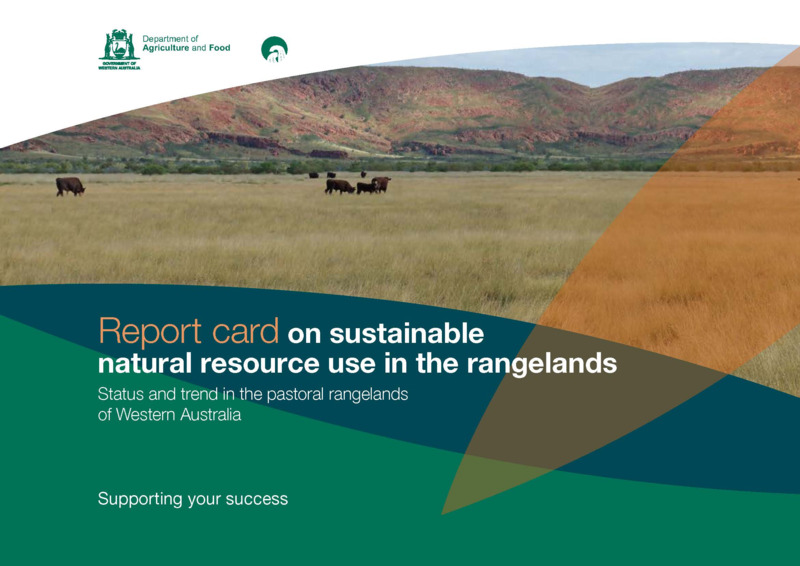 Information in the rangelands report card is intended for the use of pastoral lessees, other rangeland and pastoral managers, and industry and government decision-makers with an interest in pastoral areas. It provides a regional overview of the status and trend of the natural resource base of the pastoral rangelands in WA. The pastoral lease areas of WA cover nearly 860 000 square kilometres and have highly variable landscapes, soils, vegetation, rainfall and seasonality. To cover this huge area and variability, we reported on the status and trends at the land conservation district (LCD) level within each of the rangeland regions (Figure 1). The rangelands report card covers the drivers of change in status and trends, and individual rangeland condition themes. Fire: a naturally occurring hazard, especially in the northern rangelands, with limited management options. These drivers of change interact and their effect manifests in the themes. soil organic carbon: from modelling. The condition and trend for the rangeland’s natural resources was mixed. The important findings are outlined below. In the northern rangelands, at the aggregate LCD scale, rangeland vegetation condition was 57% good, 29% fair and 14% poor at the last assessment. WARMS monitoring sites indicate the assessed vegetation condition was stable since the last station inspections in 2002–09, except in the Ashburton and De Grey LCDs where condition declined. In the southern rangelands, at the aggregate LCD scale, vegetation condition was 36% good, 39% fair and 25% poor at the last assessment. WARMS monitoring sites indicate the assessed vegetation condition was stable since the last station inspections in 2002–09. In general, there were large variations in condition and trend of the natural resource themes, at the paddock, station, LCD and regional scales. In the Kimberley, the frequency of all perennial grasses and desirable perennial grasses was increased or stable since monitoring began in 1994, and it was high in all LCDs. In the Pilbara, the frequency of all perennial grasses and desirable perennial grasses was variable. In the Ashburton LCD, the frequency of all perennial grasses and the frequency of desirable perennial grasses have decreased since monitoring began. In the southern rangelands, the density of all shrubs and trees and desirable shrubs and trees has been variable since monitoring began in 1994, although density had predominantly decreased. In the assessment period 2010–15, the density of all shrubs and trees and the density of desirable shrubs and trees decreased in 11 of the 15 LCDs where there were sufficient monitoring sites to make an LCD-scale assessment. Estimated average vegetation cover is naturally higher in the grasslands in the Kimberley (9–44%) and Pilbara (9–30%) than in the shrublands in the southern rangelands (2–24%). From 2006 to 2015, vegetation cover was stable in most LCDs. The Nullarbor – Eyre Highway LCD has the largest increasing vegetation cover trend, largely because of the perennial grass response to the exceptional 2011 season and the significant increase in vegetation cover in four vegetation functional groups. In the northern rangelands, while stable at the LCD scale from 2006 to 2015, vegetation cover decreased in at least one vegetation functional group in each of the Halls Creek – East Kimberley, Derby – West Kimberley, Ashburton and Roebourne – Port Hedland LCDs. In the southern rangelands, vegetation cover decreased in three vegetation functional groups in the Gascoyne–Wooramel LCD, two functional groups in the Meekatharra LCD, and one functional group in each of the Lyndon and Cue LCDs. In 2015, average vegetation cover in the vegetation functional groups in the Halls Creek – East Kimberley LCD was at the low end of their respective vegetation cover ranges. Other Kimberley LCDs had vegetation cover in the mid-range. In the Pilbara, the average vegetation cover varied across LCDs but was generally in the middle to high vegetation cover range. Average vegetation cover in the southern rangelands LCDs varied, but was generally at the middle to lower end of the range. Some degree of soil erosion occurs throughout the entire rangelands, most notably in the Gascoyne and Murchison, and to a lesser extent in the Kimberley, Pilbara and Goldfields. The Upper Gascoyne LCD has the highest level of recorded erosion, with 6% of the LCD with moderate to severe erosion. Recent climatic and vegetation cover trends indicate that the likelihood of soil erosion by water has slightly increased in parts of the rangelands. Soil organic carbon (SOC) levels in the WA rangelands are low by global standards, even in higher rainfall areas. The economic and environmental sustainability of the rangelands requires that we meet the needs of the present without compromising the ability of future generations to meet their needs. Sustainable natural resource use in pastoral areas means maintaining — and where possible improving — the productive capability of the land which underpins pastoralism while mitigating off-site impact. Therefore, stewardship of natural resources in the pastoral rangelands is essential. Those who directly manage the land need to have access to the information, resources and support to carry out this critical role. Pastoral land tenure in WA is shown on the external links section of this page. Managing for the long term in a highly variable climate is essential for sustainability in the pastoral areas. Climate varies across the rangelands from a reliable tropical monsoon in the north Kimberley to the erratic desert climate of the arid interior. Rainfall variability is a defining characteristic of much of the non-Kimberley pastoral rangelands, as is increasing aridity in the inland southern rangelands. Highly variable rainfall causes wide fluctuations in the quantity and quality of forage for livestock and can lead to depletion of the critical palatable perennial pasture component. Understanding the current state and trend in rangeland condition is important to optimise business outcomes while sustaining the long-term productivity of the resource. Information and knowledge about pastoral systems are the basis for sound adaptive management. Baseline surveys and long-term monitoring provide the evidence needed to generate management strategies for sustainability. DPIRD works with a range of stakeholders to assess pastoral rangeland condition trends and to produce management information. Sustainable use of the pastoral rangeland resource requires a viable rangeland economy. It is difficult to manage the long-term resource condition without viable pastoral businesses. Innovation is important for solving problems faced by the pastoral sector. Adopting new technologies and systems can improve the productivity of the rangelands resource, reduce costs of production and produce high quality products for increasingly discerning customers. For example, innovation in irrigation development can mitigate grazing pressure on the natural resource base. Achieving sustainable pastoralism is the responsibility of all participants in the system, including pastoral managers, supporting businesses, policymakers, researchers and consumers. This report is an initiative of the Land and Water Assessment Program of DPIRD with support from other sections of DPIRD. Download the full report or the sections from links on the right hand side of this page.